Kevin McCarthy made his move with just over a lap remaining to leave the field and win the men's one-mile run at the 2012 NCAA Division III Indoor Track and Field National Championship meet. With the victory, McCarthy became the first Wabash College athlete to win a national title since Tom Puschak '89 capture the men's hammer throw title in 1989. McCarthy started at the back of the pack, moving up to second place in the final 400 meters. Coming out of the final corner before the start of the last lap, the Wabash senior made his move to take the lead, then pulled away from the rest of the field to win with a time of 4:08.93 to win by nearly two seconds. His time was just off the NCAA indoor championship record of 4:08.19 set in 2007 and easily beat the Grinnell College Bear Recreation and Athletic Center fieldhouse record of 4:13.06 set last year. "I really kept to the plan," McCarthy said. "I stayed pretty steady throughout the race, working to get to the front near the end. I knew it was all up to me heading into the final lap. If the other guys were going to go with me, they were going to be in for a fight. The mile has such a weird strategy anyway because you start kind of slow, then you have to come back really hard at the end. "This is totally awesome. I'm just thankful for getting here. This is my fifth All-American (award) but it's my first one in the mile. 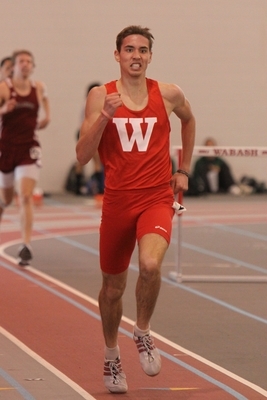 It's cool to be able to do this, it's cool to be able to bring another cap to our awesome middle distance squad that's at Wabash College and show the young guys that we've got what the capabilities are." "That was perfect execution," assistant track coach Roger Busch, an All-American during his running days at Wabash, said. "Kevin did exactly what we talked about heading into the race." McCarthy experienced the highest of highs less than 24 hours after suffering heartbreak in the distance medley relay. The Little Giants were one of the favorites in that race, with McCarthy running the anchor lap. However, a bumb at the starting line knocked the baton out of the hands of the lead Wabash runner, eliminating the Little Giants from contention. Wabash head coach Clyde Morgan helped McCarthy use that at motivation for Saturday's mile race. "I've watched Kevin race his entire college career. When he got the the baton in the DMR, I saw something I've never really seen — an angry and disappointed Kevin McCarthy. I told him after the race to harness that anger and that passion and run it out on Saturday. I think that's what he did on those last two laps. "He's the perfect example of our motto — Men Of Wabash, Nothing Breaks Us. He just never seems to get a break. Last year in the 800-meter run he got boxed out in the prelims and missed qualifying for the finals. He's battled health problems in several meets and then the incident in the DMR last night. He never let any of those things get him down. He just dug deep and found a way to run even harder and faster." Jake Waterman nearly added a second national title, finishing second in the 800-meter run nearly an hour after McCarthy's winning effort. Waterman, the runner-up at the 2011 meet, took the lead in the final lap and held it until the final straightaway. Mike Hutton from St. Thomas passed Waterman in the final 60 meters to capture first place with a time of 1:52.26. Waterman crossed the finish line in 1:52.55. Waterman earned indoor All-America honors for the third straight . He raced to All-America honors at the 2010 indoor meet with a second place finish, and finished seventh as a freshman at the 2010 indoor championship meet. Waterman also finished sixth in the 800-meter run at the 2011 outdoor championship meet. Wabash finished 11th in the final team standings with a total of 18 points. North Central claimed the team championship.